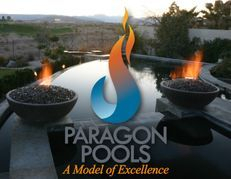 Paragon Pools is an international award-winning design and construction swimming pool and spa contractor, specializing in new construction and major renovations of residential and commercial swimming pools and spas. The Paragon Pools' team designs the complete AquaTekture habitat including pool, spa, entertainment area, landscaping, palapas, patios, barbecues, and more. Residential and commercial swimming pool and spa construction throughout the Southern Nevada area including Las Vegas, Henderson, Mesquite, Pahrump, The Lakes, Summerlin, The Summit, Lake Las Vegas, Inspirada, Providence, Cadence, McDonald Highlands, Southern Highlands, Mountains Edge and North Las Vegas. The family owned business is operated by the father and son team, Joseph M. and Joseph A. Vassallo. Both have earned the prestigious designation of APSP Certified Building Professional (CBP), the highest education level for swimming pool professionals. Joe Sr. was named 2012 CBP of the Year, 2014 APSP Fellow and is a featured professional on HGTV.com Designer's Showcase. The company is known for establishing the design principle of "AquaTekture™"; the discipline of designing, engineering and erecting of water environments and ancillary components, in a harmonious nature with consideration to function, space and aesthetics. The Vassallos have also been recognized for the company's business practices and community outreach.